Kerry caught on hot mic: Was he criticizing Israel? (CNN) - Secretary of State John Kerry raised eyebrows Sunday following comments, caught on an open mic, that left some wondering whether he was criticizing Israeli assurances that its ground offensive in Gaza would be limited? 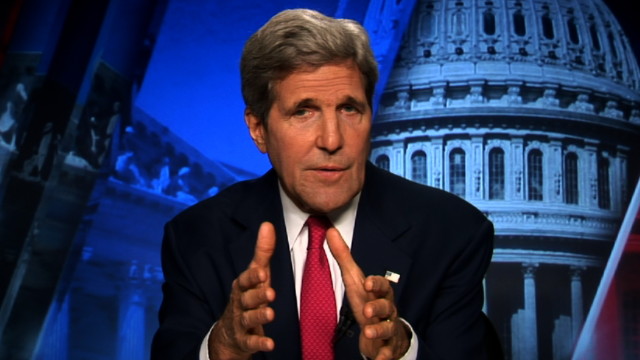 Kerry's comments occurred between multiple television interviews. He was heard in a phone conversation with a State Department deputy, Jonathan Finer, discussing the deaths of Israeli soldiers killed overnight. @ gurgy said 0bama was very smart kn0w the truth ? At what gurgy letting our border get invaded by terrorist and a possible attack ? The Border Patrol has already found prayer rugs and mats . read up . Only the truly delusional can find proof of their fantasies everywhere they look. Please don't waste anymore time or jet fuel on this. Make a few phone calls if you wish, but make them brief. Israel must do what it must do to protect its country from 7x24x365 rocket attacks from Gaza and Hamas. The Palestinians have brought this on themselves and should suffer the consequences. They VOTED FOR these Hamas terrorists and now they have become terrorists and terrorists sympathizers. So bottom line is you lay down with dogs, you get fleas. You lay down with terrorists, you get treated as a terrorist. Yeah, the Palestinians voted for Hamas. They were duped into believing that moderation, caution, and negotiation was a weakness, and now they are paying the price. The neo-cons in the right wing in this country make the same arguments. The war mongers, the fear mongers, and the hate mongers are what will divide and destroy this country. @Tone you should move to Gaza and take your Anti x with you that would be fine and the usa could recover from the mess that you follow .